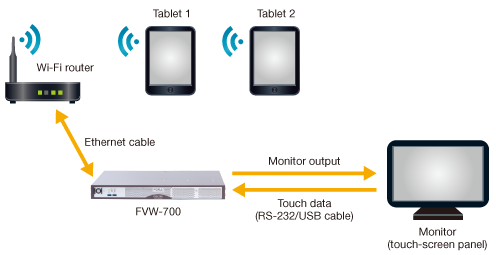 Annotate or draw on video using a touch-screen computer monitor or wirelessly connected tablet as you check the point of insertion. Without requiring you to work at a console, the system enables a variety of scenarios. Choose from four models for specific needs, including a FVW-7SO 4K model. Edges of lines you draw can be recognized as outlines of a larger shape and joined, using a more advanced edge-rendering algorithm. Improved automatic freehand formation with noise reduction (algorithm) allows smooth objects to be shaped, and sharp angles to be achieved. Draw objects that will only cover images of a specified color in the video. In this example, specify green to avoid covering players with the objects you draw. Control the telestrator wirelessly from tablets running a dedicated app.